I have received multiple weather alerts that over 50,000 folks are without power at this time and parts of I-40 have closed down due to downed power lines on the highway. All I can do at this point is ride the storm out and hope the power here does not go down. Meanwhile I took some photos of the amazing looking trees with the ice build up on them. 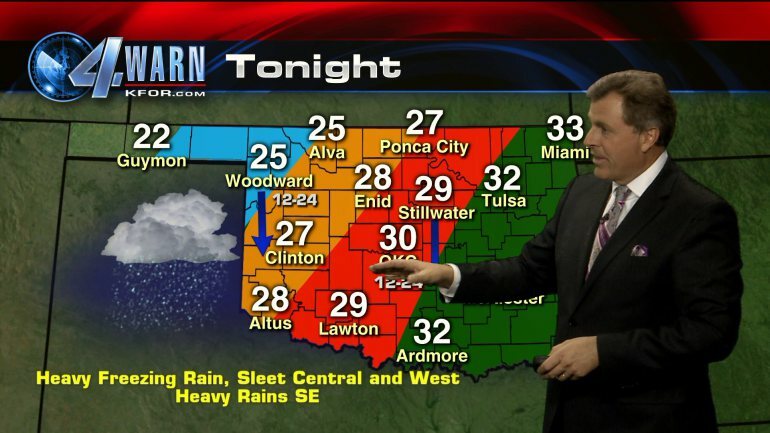 I know this is not as severe here in my neck of the woods as it is in western Oklahoma, for which I am thankful. However the trees look beautiful decked out in their jewels of ice and I thought I would share. The Mulberry Tree (in the Cedars on the left) seems to hold the ice more than the Cedars. The ice sparkles in the light. It is actually quite beautiful. The trunks don't seem to be accumulating ice. Yet. The forest is beautiful with all the natural frosting. Winter is fighting with fall to see who will win. The new gutters are doing their job nicely. Another shot of the Mulberry. As I was typing this post I received another weather alert extending the ice storm warning through Wednesday of next week! Crazy! Well that is Oklahoma weather, nothing I can do about it but sit back in my cozy and warm Tiny House! What are you doing to stay warm during this time of year?